Shakti mats were something I came across when I was studying at University in New Zealand and dabbled in the odd yoga class. It’s designed for you to stand or lay down on and it’s spikes works as a form of acupressure and within 20 minutes helps you to relax tense muscles, recover from headaches of muscular injury, improve circulation and improve overall wellbeing. I've always had bad posture and incredibly tight shoulders after a surfing accident when I was 14, however more recently working in front of a computer all day means that the posture is getting worse. I’m big on yoga, so after every class it was becoming more apparent that I needed to level up my game when it comes to my posture and pain, hence diving into the world of the Shakti mat. Turns out, acupressure mats are more popular than I first thought, so to find one that is made ethically was quite a challenge, until I found Shakti. I wanted to find a business that not only created a great product, but also one that was made ethically and actually empowered those who make it. For Shakti, their mats are made from organic cotton, dyed from organic dyes and made under fair working conditions in Varanasi, India. The name Shakti means the divine feminine power, which fits perfectly with the fact that they only employ women to make each mat. In India, women often have difficulties finding work that can be combined with their responsibilities within their household which is why the founders of Shakti made the decision to help combat this. For the two months, I've been using the Shakti mat almost daily. I lay on it when I meditate (not as frequently as I’d like), but I also stand on it every morning when I begin my day working. At first I was skeptical to see if this mat really does live up to what it’s said to, and I’ve been pleasantly surprised. I will note however that the first few times you use it, it isn’t fun. Shakti also have over 2000 reviews on their website that I recommend checking out if you're interested in learning more about this mats. 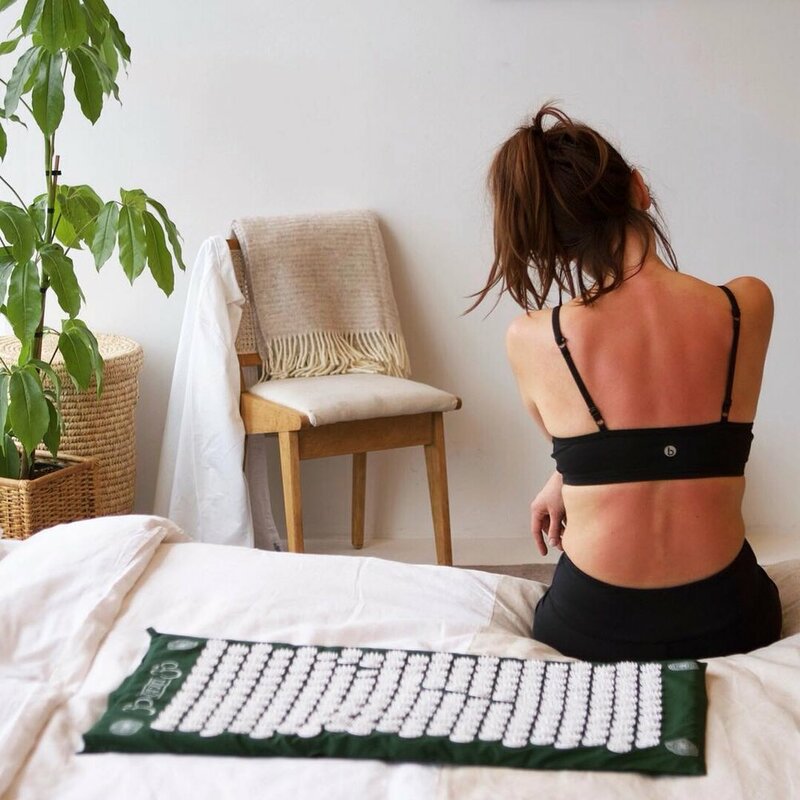 If you've been looking to up your yoga and/or self-love practice, or if you've been on the hunt for an acupressure mat but couldn't find one made ethically, check out Shakti. An interview with Jon Heslop, the co-founder of Shakti mats. 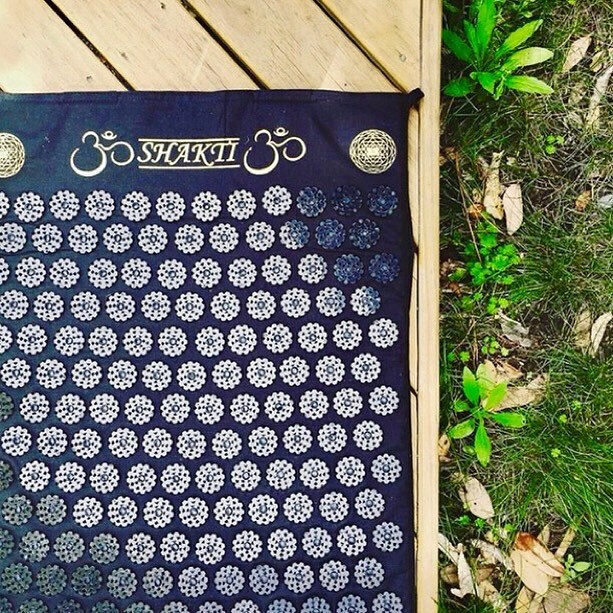 What made you start Shakti Mats? Shakti Mats was started as more of a project than a business- we really didn’t see it going where it went. It was a combination of the influence of finding something that we absolutely loved ourselves, something we couldn’t stop showing people and talking about and a curiosity about what went into starting a business, and whether it was something we could do on the side of our Uni studies. I’ve heard that a business is the ultimate expression of your personality, the way it behaves reflect you own values. But I think too that this goes both ways- you shape the business and the business shapes you. Our growth, inside such a short time frame, has forced an enormous about of personal growth to follow it. We’ve had a lot of the trials in terms of responsibility, high pressure decision making, delegation standing inside our values on ethical production etc. that many people won’t face until they have children, buy a house or reach the higher places of their career. I joke that is aged me 10 years emotionally but only 5 visibly. So its a win all in all. Within the ethical fashion community, there's a big question that we ask which is 'who made my clothes?'. In the scope of Shakti Mats, who made your acupressure mats? Can you tell us a bit about them? The heart of our production happens in the holy city of Varanasi India. Hidden amongst the dusty crowded streets is our quiet refuge of the Gratitude Workshop. At 10am the doors swing open and 72 women arrive to begin their day working carefully, lovingly, to craft by hand Shakti Mats which will eventually find their way to the hands of a lucky kiwi. Everything here is rooted in tradition and craftsmanship. The sewing machines are manual operated by foot pedals, the screen printing happens through a delicate layering of plant based dyes over organic cotton trimmed by heavy metal scissors. Each spike is affixed by hand. In Varanasi, Shakti hires only women. It is our way to empower women in rural India to give them choice, purpose and community. Gratitude goes both ways in this special place. The women craft beautiful products with love. In return we are care for them like family. We provides excellent pay, flexible and fair hours, a nutritious daily meal, and a work environment that has a sense of peace and harmony in it. If the women are sick Shakti will take them to a doctor and pay for their medicines. If a tragedy strikes an employee's family, Shakti has a fund to support them through to the other side. Gifted young girls from the families in the most need are provided with scholarships to attend private school throughout the entirety of their education. We visit the Workshop personally regularly, and stay in the Workshop for days at time. On our last trip they gifted a beautiful Sari to each women and thanked them through a message translated to Hindi. Its incredibly moving to meet the women behind the Shakti Mats. Through the tough times in the business visiting there reignites the passion to keep doing what we are doing. With the growth of the company we are expanding our ethical production to Delhi where we are carrying the core values of fairness, care, and support for our employees. Already some of our products are coming from here and we’re just as proud of what we have achieved thus far in Delhi. Organic cotton is a big one. Its good for the environment, healthy for user, but for myself personally the big one is the people picking the cotton. It is a highly manual task and there is a lot of exposure to the plant, personal protection for workers can be questionable. My Dad is a farmer, and works with spray. He has always warned me so gravely not to be around the chemicals when they are being mixed or the fields soon after they are sprayed. It makes sense for me to work with organic cotton for this reason alone, supporting healthier work conditions for people picking it. Organic dye is a great one too… its just better. We use ABS plastic for the spikes (the same that lego is made from) and we occasionally receive criticism about the use of plastic. The same can be said for the 'bedding quality' foam inner. For me, we’re making products that will last and exceptionally long time and provide an exceptionally large amount of good. Our mats aren’t disposable or filling up landfills and that is the real problem. Care for them and you won’t ever need another. It justifies the use of plastic and foam to keep doing what we are doing until a viable alternative presents itself. It changes regularly but right now I like the idea presented in “Man’s Search for Meaning” that you cannot control what happens to you. But you can control how you respond to it. No one can make you feel a particular way and it is always your choice. Its a terrifyingly true piece of wisdom which implores you to take control of your life and not become a victim. I don’t think a life dedicated to making money in itself is ever particularly fulfilling. There needs to be a bigger purpose. We found that in Shakti. A product that is made ethically, that helps and heals people. Its a big tick from us. We need to reconnect with the people who make our things. We also need to reconnect with our bodies and our natural internal healing processes. The Shakti Mat faciliates both these things. That is far more rewarding than profit. A big one we’ve learned recently is that what is considered “good" or "fair” varies. Expanding our production over the Delhi from Varanasi we thought would be a copy and paste exercise of all the conditions. When we flew there we realised that this wouldn’t work. People have different wants and different needs, often our New Zealand centric idea of what is best doesn’t cross over culturally, and you can do more harm than good enforcing what you think is right. It starts with listening. Listening to the people, meeting them and understanding their needs. Only then should you begin actioning anything. Keep your receipts, file them properly, right from the start. The amount of time I have spent trying to find a particular receipt from 4 months ago is mind-boggling. Make it a habit you will save yourself a lot of headaches down the track. Where do you envision Shakti Mats in the future? We want to take the awareness global. There is a lot of people who would really benefit from having a Mat. We want to stay true to our values of making good products in a good way that actually help people, and to build and reinforce our efforts here as we grow. 1. the reviews we get from customers. Truely, some of them are overwhelmingly positive. Reading reviews where people have passionately told us about how the mat has finally allowed them to sleep the whole night, or changed their life in some significant way, makes me feel so inspired. 2. visiting the places we produce in India. Seeing the smiles and the warmth in those places is totally uplifting. Yoga. Gratitude Journal. Soaked Oats. Coffee. Read. Start the day already feeling accomplished. Of all the self help books I’ve read this one is the most accessible and carries all of the most important messages. A great starting place on a journey of personal development. Planet Earth II series with David Attenborough. To fall in love with our planet. Incredible man doing incredible things with plant based plastic. Not sure of the people behind this one’s names but Duffle & Co.
Ethically made bags and clothes. A lot of people out there fighting the good fight.